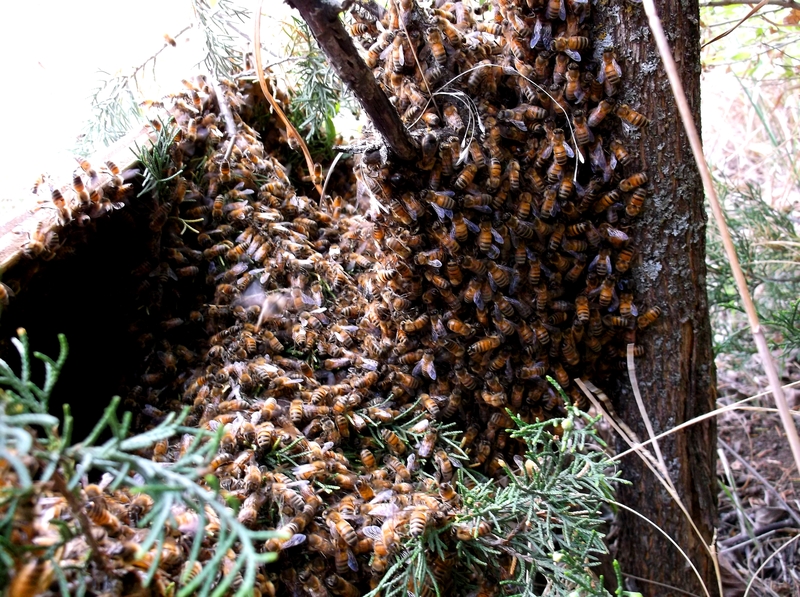 Well folks, this is the swarm that I got a couple weeks ago in Augusta. That first night was pretty tragic as I lost about half of the bees. 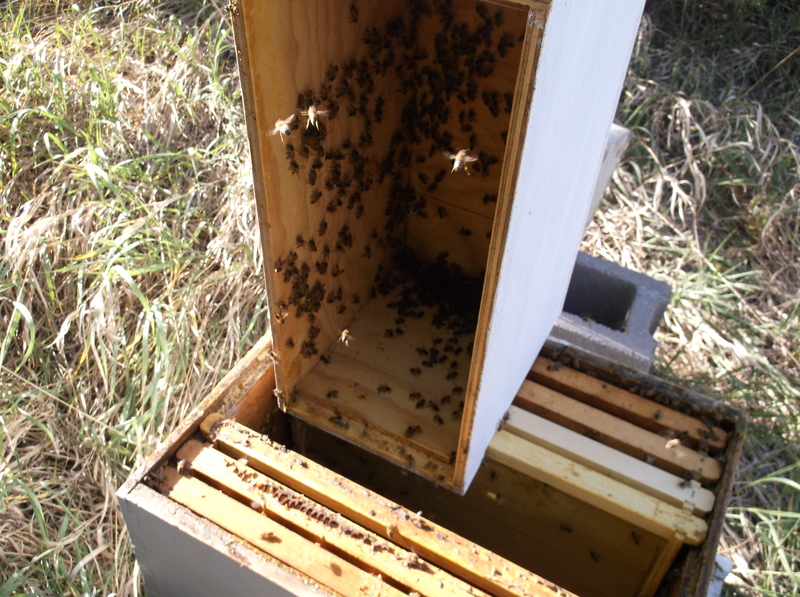 I had dumped out dead bees and put the remainder back into the nuc box and after a couple of days of settling back in, i then took them out to Mom & Dads place still in the 5 frame nuc box. Last night was my first chance to open it up and see what I had. 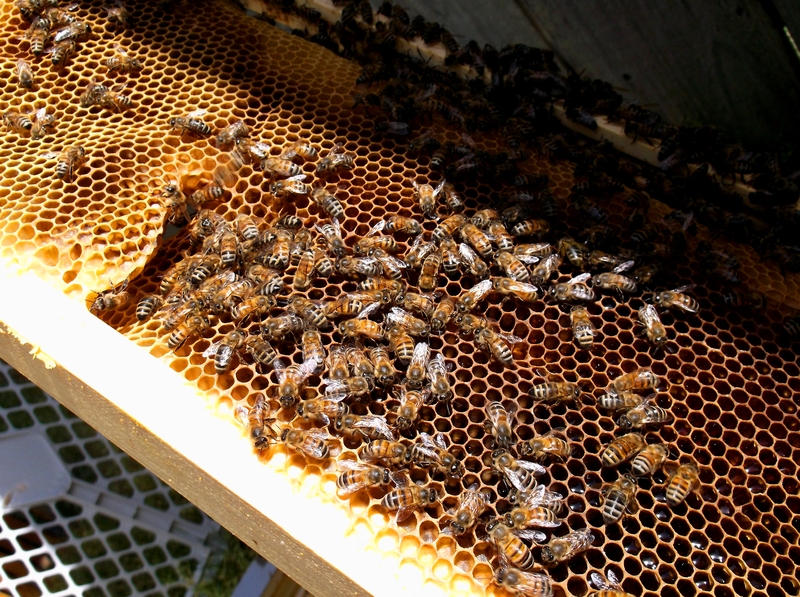 I found no queen, a diminishing population of bees, and no drawn comb. I had put one frame of drawn brood comb in there for them, but they seem to have no interest in getting started on drawing any new wax. I’m sure that this hives loss was my fault. I went ahead and put them into a 10 frame hive and at this point I am feeding them and just hoping that they will draw out a couple of frames before they go. I was hoping that one of my two hives would have a queen so I could combine them to make a stronger colony, but that doesn’t seem to be the case. I hate to lose the genealogy of the swarm that I collected because they seem to have a great demeanor. Live & learn. If anyone in the area has a queen, leave me a comment. I would even pay for an old, nasty queen that someone is considering pinching. She could at least get me some eggs to build a new queen from. Arrrgghh! Deep frame filled with nectar/honey. 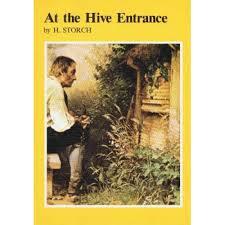 Deep frame packed with nectar/honey. Queen-less hive. Well, after giving the girls a break for a few days, I decided to open up the hive that was a split that Julie and I made from her strong hive. Unfortunately, there is no queen and no sign of eggs. So she either wasn’t viable, or she took a mating flight and never returned. My only saving grace right now would be to get a new queen. I’m sure if I was lucky enough to find one this late in the season, I may run out of nurse bees and the hive could be lost anyway. 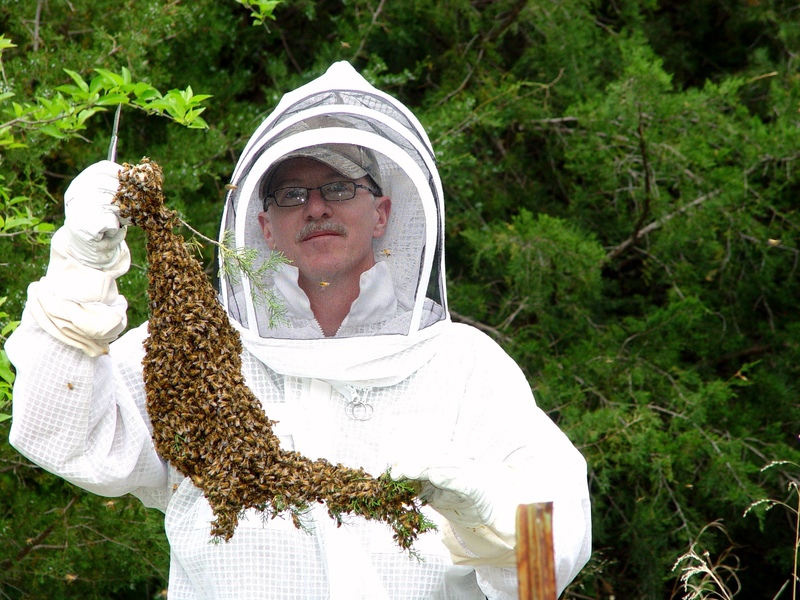 I am hoping for another strong swarm to add to them, but my phone hasn’t been ringing much this season. On the plus side, those bees are working away packing honey in every cell of my the deep hive. 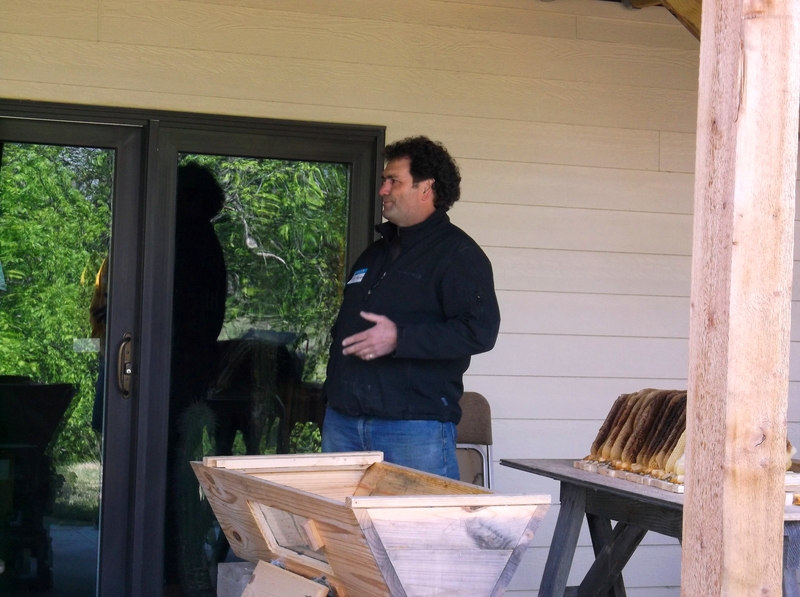 They already have some capped honey stored in upper corners. So I suppose even if I lose this hive, I may have enough honey to last my family through the summer. I really hate to lose this hive, but we sort of knew it was a long shot. What a truly humbling hobby this has been for me. All money out… no money in. Maybe I should have set it up as a business so I could claim my losses this season. 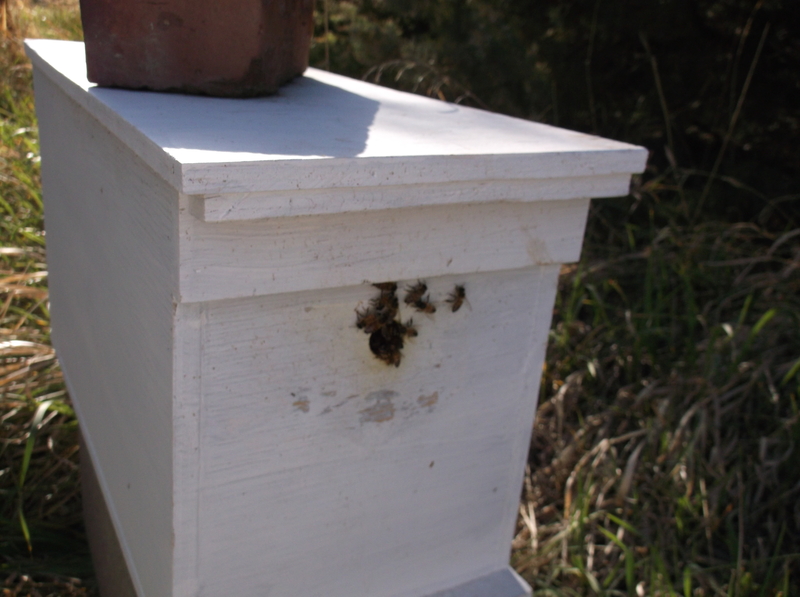 I took some feed out to my swarm nuc last night. I didn’t open them up but the activity looked good. I saw them bringing in pollen. I always take that as a good sign, but only time will tell. 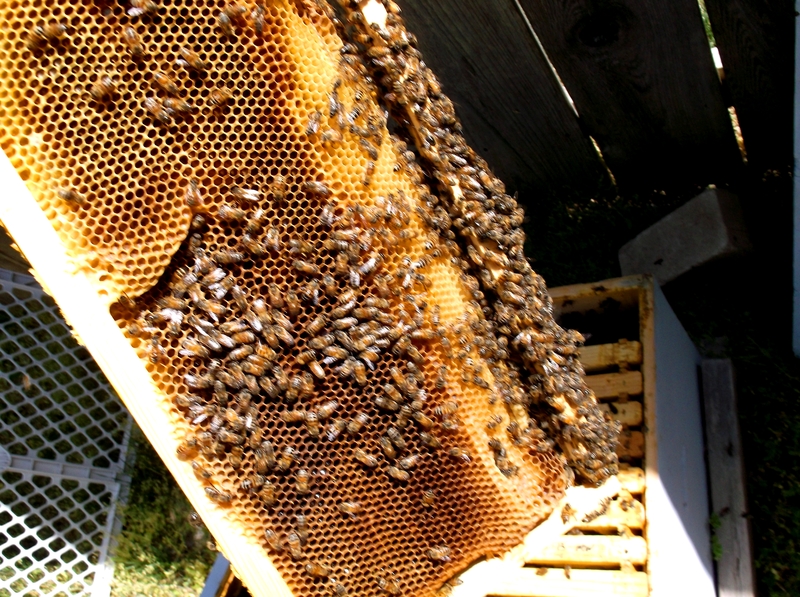 I hope to check the nuc for a queen this weekend and transfer them into a deep hive if the weather cooperates.